Keeping track of time has never been simpler. At UK Time Solutions, we have a solution that incorporates both the time and date. The NT-20A job timer and document time stamp is a time recorder that has been designed to make it clear just how much time you’ve spent on jobs or for accurately recording the time and date on a document, The machine is extensively used for garages and workshops to record repair and warranty claim times. The electronic time stamp will also include the date and year making your documents look more professional. We supply the NT-20A job timer and document stamp to offer maximum functionality and is a practical solution for highlighting when work was started and completed. The job timer and document stamp have a battery backup, so you needn’t worry about it losing its setting in the event of a power failure. As well as this, the NT20A job timer and document stamps are designed to enhance the accuracy of any company paperwork, ensuring that your work accordingly to time meet all deadlines. UK Time Solutions provide the NT-20A job timer and document stamp to be versatile, it can either be mounted on the wall or on a table, it merely depends on what suits your business needs best. Our time and document stamp is guaranteed to improve the efficiency of your business and is easy to use. 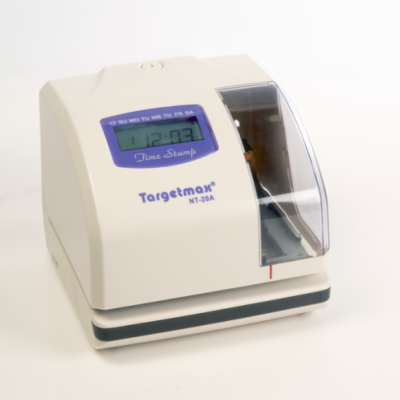 Could you benefit from the NT-20A job timer and document stamp? - The ETR-20 is the ideal choice for every business application the requires a time, date and/or number stamp.